The four-in-one carnival game for kids! Step right up to Cranium Balloon Lagoon, a wondrous carnival of fun for kids! The game's exciting sights and sounds make spelling, matching, and counting fun -- so kids learn as they play. Spin the colorful merry-go-round to choose an activity, start the musical timer, and jump into one of four exciting Balloon Lagoon activities: fish for letters at Letter Lake, match treats at Snack Hut, spin a picture puzzle at Tumble Tides, or flip frogs at Frog Pond. With each success, kids collect balloons and move closer to victory. The first to collect 15 balloons wins! 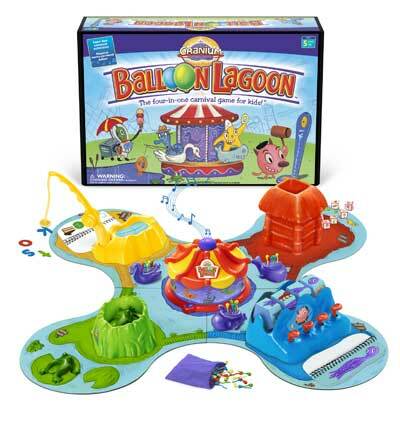 Each game lasts about 15 minutes, but kids love to play again and again -- making Balloon Lagoon the perfect game for filling a few spare moments or a full afternoon. The rules and assembly are easy, and reading is not required, so kids can enjoy the game on their own, though we guarantee you'll love to play too!